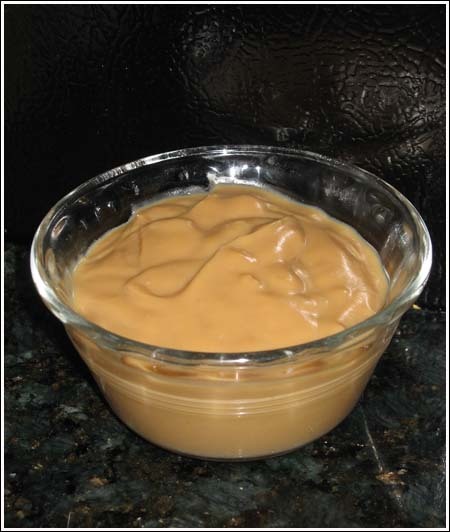 An easy butterscotch pudding that can be made with whole or reduced fat milk. In a mixing bowl, preferably one with a little spout on it, whisk together 1/2 cup of the milk, the egg yolks, brown sugar and cornstarch. Add a pinch of salt if desired. In a heavy, dry saucepan, heat the remaining 2 1/2 cups of milk over medium until it begins to bubble around the sides. Using a half cup measure, scoop out half cup of hot milk and whisk it into the egg yolk mixture; Repeat twice, measuring out about ½ cup milk and whisking it into the egg yolk mixture. Now pour the egg yolk/hot milk mixture back into the saucepan with the remaining hot milk. Keep heat at medium and cook, stirring very often, until it begins to thicken and boil. Boil, whisking constantly, for two minutes. Remove from heat and stir in butter. Let cool for about a minute, then add vanilla extract. Strain into a bowl. If you don't have a strainer and don't mind a few lumps, you may skip this step. Place a sheet of wax paper over the bowl of pudding and let it cool at room temperature for a few minutes or until you feel confident that it is cool enough to put in the refrigerator without heating up your refrigerator. Chill for about 3 hours.